AVA ZINN WANTS TO KNOW investigation has revealed after the webmaster herself personally went to the Tamera Gardens Apartments to see the damage herself and got some new perspective. June 13, 2018 - Ava Zinn and Aeverine Zinn Holdings learned about a devastating fire that occoured on the afternoon of June 8, 2018 at Tamera Gardens Apartments when FWFD crews arrived and found the entire attic area on fire with heavy smoke showing. Crews ensured that the building was empty and attempted to extinguish the fire but were unable due high heat and heavy smoke. One Firefighter was injured at the scene and transported to a local hospital in stable condition. This fire is under investigation. The Red Cross was on the scene to assist those families that were displaced due to the fire. According to 21Alive, The Red Cross provided only two nights and eight residents are scrambling to find a place to stay once the morning of June 11 came. The eight families forced out of their Tamara Gardens apartments after Friday's fire pleaded with community leaders for help getting into new units and from watching the news reports from WANE-TV and 21Alive, it does not appear that there’s a reasonable solution and that met the threshold to help them as much as possible. As someone who has only lived in Fort Wayne since May 14, 2018 at Brendonwood Park Apartments (which is nearby), I figured it was best to post a GoFundMe Page to Help those eight residents at Tamera Gardens who were displaced as I was able to determine according to 21Alive’s report the management at Tamera Gardens appear to be breaking the law somehow (but it is unconfirmed). WPTA-TV reports the residents say they're hearing that management is actually taking names off of a waiting list to move into vacant units within the complex instead of taking care of the people who have lived here for many years. "I guess they like taking care of them but what they should be doing is trying to take care of us. You know, I've been here going on 14 years in that very same apartment. I haven't been late with my rent or anything. Never missed nothing," Betty Tucker says. "With people that come out here and stay and they've paid for several years and been good tenants, you would think they'd go out of their way to try to put them up. But you've got families now that are displaced and really broke and they need help," Kent Ferguson says. The tenants at Tamera Gardens say the properties have vacant units, and can't understand why they can't move into them. "It hurts because I thought that the company was more reputable than that. And right now it just seems like they just don't care. I understand that they're taking a loss too, but you've got people around you taking a bigger loss," Ferguson adds. 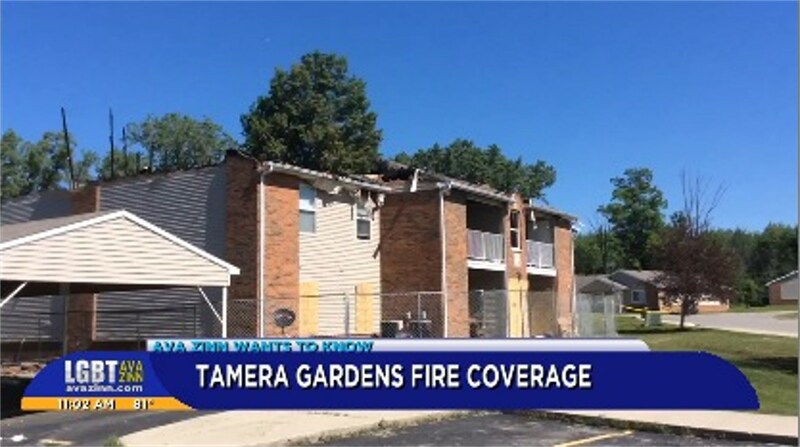 Managers at Tamara Gardens told WPTA-TV all available units have been spoken for, and that it's illegal to bump the displaced residents to the top of the list. They also tell the Fort Wayne ABC affiliate they're working with other apartment complexes in town with availability to try to find space for the displaced residents. So with that in mind, after hearing reports and from what I have heard, it really struck a nerve as I had went through something similar when I lived in Van Buren (coincidentally nearly 24 years to the day) an arson happened. That is why I decided to post a GoFundMe Page to HELP the Tamera Garden Eight and I’m not doing this for attention. I’m doing this because they are my neighbours and fellow Hoosiers. It is the right thing to do. That decision has come with some backlash as many people say this is a scam. WRONG! This is legitimate. This story will be updated until it reaches a conclusion. By posting this from a neighbor’s perspective at a nearby apartment complex, you are able to see another perspective that is more believable than the next guy. This is why I do web sites and launched this web site nearly 20 years ago.